Acne prone skin care, facial cleansing, eczema prone skin. Developed with dermatologists, CeraVe Foaming Cleanser gently foams to deeply cleanse without disrupting the natural skin barrier. This refreshing gel, with 3 essential ceramides and hyaluronic acid, effectively removes excess oil, dirt and makeup. The gentle, non-irritating formula provides all day hydration for dry skin. 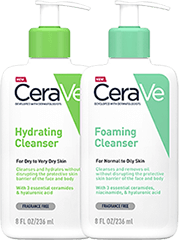 CeraVe Foaming Cleanser is fragrance free, sulfate free, paraben-free, oil free & allergy tested. Sebum is the main ingredient in your body's natural oils. It's created by your sebaceous glands to help to moisturise and protect your skin. Those with oily skin types often have excess sebum, which can result in skin problems. Eczema Association of Australasia™ endorsed. The EAA stamp identifies products that are suitable for eczema prone skin. Moisturises and helps restore the protective skin barrier of the face and neck.